Guest Blog Post – Think Historical Romances Are Boring? Think Again! Recently, a woman told me that she loved romances, but didn’t read historicals because they were boring. I replied, “Some of them might be, but not mine—far from it!” I’m not sure if I convinced her to try historicals, but our conversation got me wondering, why do some romance readers think historicals are dull? Maybe they were turned off by boring history lessons in school, or they think nothing exciting happened in the days before electricity and the Internet. Perhaps they tried a historical romance ages ago and it was weighted down with hard-to-read language or endless “boring” details. I write historical, gay, paranormal, and contemporary romances. People often ask me how I can switch genres so easily. “What’s the trick?” they want to know. Well, the trick is… there is none. Writing historical romances is pretty much like writing contemporaries. I use the same basic storytelling techniques—an interesting plot, sympathetic characters, and the right mix of backstory, setting, and details that draw readers into the story and keep them there. Just because historical romances are set in time periods before cars and cell phones, that doesn’t (or shouldn’t) make them boring. There is plenty of action, adventure, intrigue, danger, comedy, and sensual love scenes. And these are the same elements that go into making a compelling contemporary romance. I bring my historical romances “out of the history books” and into the everyday lives of my characters. I focus on how the hero and heroine meet, fall in love, overcome their obstacles and challenges, and eventually live happily-ever-after. And they are far from shy when it comes to having fun in the bedroom! The heat levels in my romances vary from mildly sensual to super-scorching hot—depending on the characters and their storylines. As I’m writing, I only include the historical details and descriptions that are integral to the story. I don’t bog down the plot with a step-by-step procedure for churning butter, or go into an endless description of how to unfasten a corset (unless it’s befuddling the hero who’s eager to remove it!). In a way, it’s “harder” to write historicals because of the amount of research involved, but I get to explore different time periods, characters, and settings—then let my imagination run free as I write. For example, when I wrote Wilderness Bride, I researched mail order brides, different time periods in American history, Native Americans, fur trappers, traders, and more. Some of the interesting things I learned in my research I added into the storyline or weaved into the background, but I couldn’t use everything. It was important for me to convey the flavor of the time period while keeping the reader hooked and the plot moving. Every romance genre has its fans. Some people like to read contemporary romances, others live for paranormals, and there are those who switch up genres and read anything that sounds appealing. I like writing historicals—but I also write contemporary, paranormal, fantasy, and gay romances, too. Why? Because I enjoy writing about interesting characters that fall in love, whenever and wherever that may be. Shauna curled her hands into fists and shot to her feet. Questions? She had a thousand but dared only one. “The room there, sir, on the other side of the foyer . . . what’s that?” She pointed to the closed door. You’ve written 90 short stories, 17 romance novels (for Amber Quill Press and Medallion Press) and four non-fiction books. Are you focusing on one project at a time or working on multiple projects? When I’m writing, I focus on one project at a time. As I write the first draft (whether it’s a short story or a romance novel), I divert all my attention and energy into the story until it’s finished. After that, I set it aside and work on other projects, such as submissions, promotions, blogging, updating my site, or outlining another story. After a few weeks or so, I go back to the new project with fresh eyes and start making revisions. What romance genres do you prefer to write? Do the characters or the plot come first? Although I have written romances in contemporary, gay, and paranormal genres, most of my romances are historical or historical/fantasy. I like writing historicals because I can explore different settings and time periods, but I’m not “married” to one particular genre. Before I start a book, I need to know who the characters are and what’s going to happen to them. After that, I outline the scenes and start writing. As I write, I allow myself some leeway to explore things I hadn’t considered in my outline/list. I might add entire scenes or write scenes that are later omitted. Writing a new book is always an adventure for me and I never know where the characters or stories will take me. When is the best time for you to write? I don’t have a set time or place devoted to writing. Basically, I write anytime, anywhere. I like to write outside, so if I’m working on a book and the weather’s nice, I’ll sit in my yard and write or edit, or outline a new book. Otherwise, I find a quiet spot in the house and write. 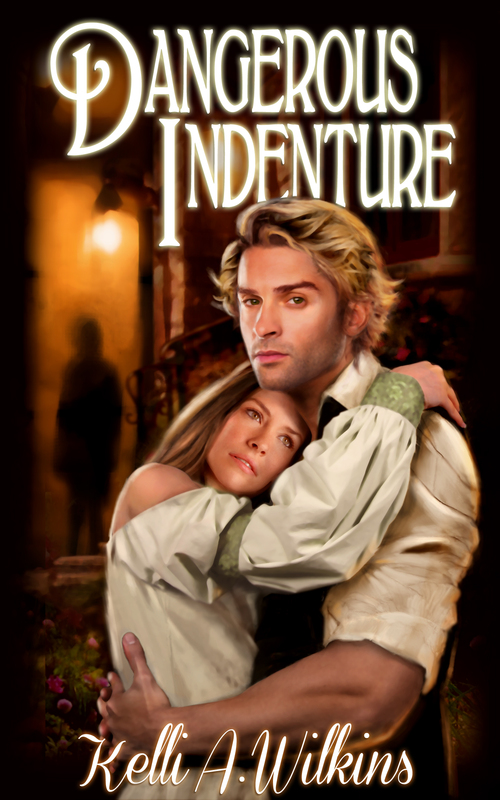 One of your latest novels is a historical romance entitled Dangerous Indenture. Can you tell us about Shauna Farrow’s need to escape her past in Ireland? Shauna is an independent young woman who was forced to fend for herself at a young age. Without giving too much of the story away, she trusted the wrong person and got herself into a bad situation in Ireland. She was given an option to leave the country and decided to start over in the Colonies. What does she agree to as an alternative to her life now? Shauna agreed to become an indentured servant as a condition of her passage to the Colonies. It seemed like a good idea at the time, but soon after she arrives, she wonders if she made the right choice. But she soon learns that what she signed on to do may be as difficult as her past. Is there any way she can flee her employment and start over? No. There’s no way for Shauna to get out of her indenture to Joshua Stewart. She is legally bound to stay at Stewart House for five years. If she tried to run away, she would be arrested and thrown in jail. Who helps to change her life for the better? But then things start getting mysterious. Why is Shauna afraid for her life? A previous servant died under mysterious circumstances and everyone thinks someone at Stewart House murdered the girl. Shauna suspects Joshua’s other son, Colin, or his mentally unbalanced wife, Minerva, is the killer. When another servant vanishes, Shauna starts investigating and risks her life to find out the truth. What is it you love about this book? I love the characters, the setting, and the fact that it’s a romance blended with mystery. When I created the characters, I gave them all interesting backstories and unusual quirks. I had never written a romance set in Colonial times before and blending the romance with suspense/mystery was a lot of fun. Dangerous Indenture is one of those books that jumped into my head. One day, I overheard the name Shawna Farrell, but I thought I’d heard Shauna Farrow. The name stuck with me and I wrote it down. A few minutes later, I knew all about her: she was an Irish indentured servant who came to Pennsylvania Colony and worked at a house where another servant was murdered. Once I knew that, I started outlining the book. Did you do a lot of research for the book? Did you find the Internet or books on the time period more helpful? Yes, I had to do a lot of research! I was starting from a good place with the book – I knew where I wanted to set the story and approximately what time frame. I spent a lot of time in the library going through history books, reading up on Colonial times, and indentured servants in general. I did some Internet research, too. As I wrote the book, I incorporated my research in as background details. What formats is it available in and where can we buy a copy? Thanks for letting me share my thoughts with readers. I invite everyone to visit my site to catch up on my other romances, sign up for my newsletter, and email me with questions or comments. If you’ve read the book, I’d love to know what you think! Kelli A. Wilkins is an award-winning author who has published more than 90 short stories, seventeen romance novels (for Medallion Press and Amber Quill Press), and four non-fiction books. Her romances span many genres and heat levels. Kelli had two historical romances published in spring 2014: Wilderness Bride from Amber Quill Press: http://www.amberquill.com/store/p/1941-Wilderness-Bride.aspx) and Dangerous Indenture from Medallion Press: http://medallionmediagroup.com/books/dangerous-indenture/. When Daisy Buchanan, the owner of Sometimes a Great Notion, purchased a dollhouse for a young friend she has no idea what it would lead to. She knew the Victorian dollhouse needed tending loving care to be a perfect birthday gift for a friend’s daughter. 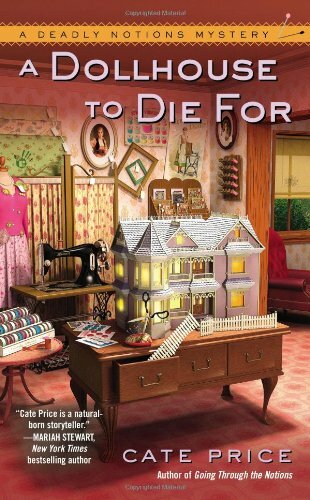 First avid doll and dollhouse collector, Harriet Kunes, demands Daisy sell the dollhouse to her. Shortly after, Daisy and her husband find Harriet dead in her home. Harriet’s collecting days have come to a dead halt and not because of natural causes. 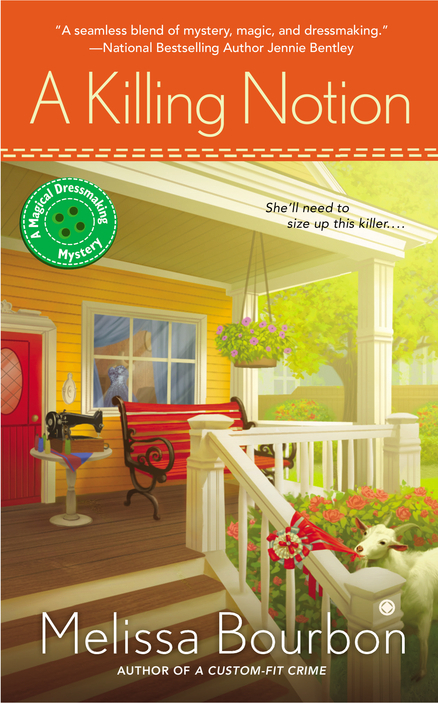 While they are not suspects in what has now become a murder case, their friend, Detective Tony Serrano has taken a serious interest in Daisy’s intuitive thoughts. Before Harriet is even buried, her husband is making wedding plans and preparing for the sale of the house. Her nephew is making plans to kick Daisy out of the store she loves. Someone else is trying to steal Daisy’s gift to her young friend, and more deaths keep on adding up. The author presents numerous possibilities of who could have done it, but you don’t really know until she points it out in the end. I got the small town feel for the setting. Daisy’s love for the nineteenth century village, where her store was located, was evident. The Buchanan’s home was descriptive enough for me to imagine walking through, as well as Harriet’s home, Cyril’s junk yard and the dog park. Her friends had great personalities, skills, and were compassionate. The wealthy women were realistically presented as snobs. The author even tries to get you to understand where each of the possible suspects are coming from. You begin to understand their situation. This book is about greed, solving layers of mysteries, and the fact that you don’t really know a person until they point a gun to your head. Anyone can be a criminal in a novel. I loved the book and look forward to reading other novels by Cate Price. I really wanted to see Daisy’s friends combining their skills to create a new type of business under one roof. 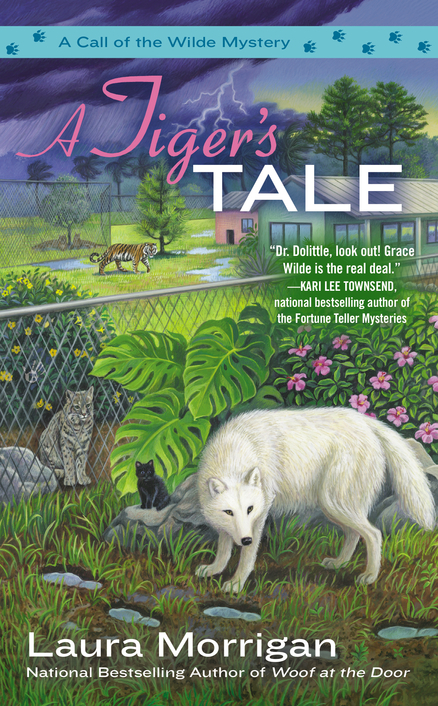 Grace Wilde is called upon to learn why a normally calm Siberian tiger at a donkey and big cat rescue is very anxious. While others might not understand that she can telepathically bridge with animals, Grace has been able to since she was a child. When Grace learns that a young volunteer at the retreat is kidnapped, she informs Kai Duncan, an investigator. Brooke’s mother and stepfather think she’s a runaway, but her peers at the retreat think otherwise. They’re aware of the tension in Brooke’s home and that her boyfriend could have a troubling life, as well. Since her mother hasn’t reported Brooke missing, Grace goes by the retreat animals’ comments that she was “taken.” Every clue is gathered through their behavior and the last actions Brooke made before her disappearance. Like most mysteries that deal with amateur sleuths, Grace goes by intuition and her own investigation even if danger is only a heartbeat away. She seems to go down the most dangerous path one can take. She is totally devoted to not only learning the truth, but finding Brooke. When a person is abducted, every moment is so important. A Tiger’s Tale was woven with suspense and bravery. I applaud Grace’s courage and love seeing strong and intelligent protagonists. In this book, the major setting was the retreat. Grace ventures into a few other settings as part of her investigation, but the retreat seems the most descriptive and important. In terms of characters, Grace, her sister, and retreat owner, Ozeal Mallory, are well drawn so you can picture them and relate to their challenges. There were serious issues unveiled and danger around every corner. I appreciate this type of cozy more than the humorous. This is a book to be shared. Brooklyn Wainwright might not know how to cook, but when it comes to the art of bookbinding, she’s a professional. It’s no surprise that her sister, Savannah, asks her to restore a cookbook that she wishes to return to her ex-boyfriend, Baxter. Brooklyn immediately recognizes the rare and precious cookbook, circa 1782, which is part receipts and journal of a cook named Obedience Green. After restoring the book, Brooklyn finds it difficult to part with it, though she does give it back to her sister. During a guest chef event celebrating Baxter Cromwell’s new San Francisco restaurant, Savannah presents him with the rare cookbook. Clearly, his reaction wasn’t what either of the Wainwright girls expected. Not only didn’t he appreciate the gift, he was angry she presented it to him in public. The explanation for his anger was not stated as Baxter was found dead in his own kitchen by Savannah. The authorities suspect his old friends of killing him and demand that they don’t leave town. Now, the only thing cooking is mistrust. Any one of them can be Baxter’s killer. 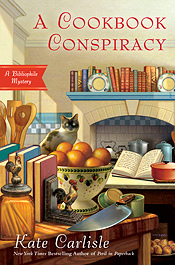 A Cookbook Conspiracy is an intelligent mystery with history in the mix. Friendship, jealousy, greed, distrust are all part of the storyline. The characters all have realistic personalities, backgrounds and roles. Not only does each chapter keep you turning the pages, it makes you hungry. You’ll gain more than a few pounds with this novel. Loved the setting and the intrigue, as well as the secondary characters. A great book and I do hope to read more from Kate Carlisle. GWN is proud to announce that Kelli A. Wilkins has scheduled a 3-Day Blog Tour: May 22-24 and June 4-6. Two of her latest novels will be featured in this wonderful opportunity to get to know Wilkins and what inspires her. Wilkins writes romance, horror and non-fiction. 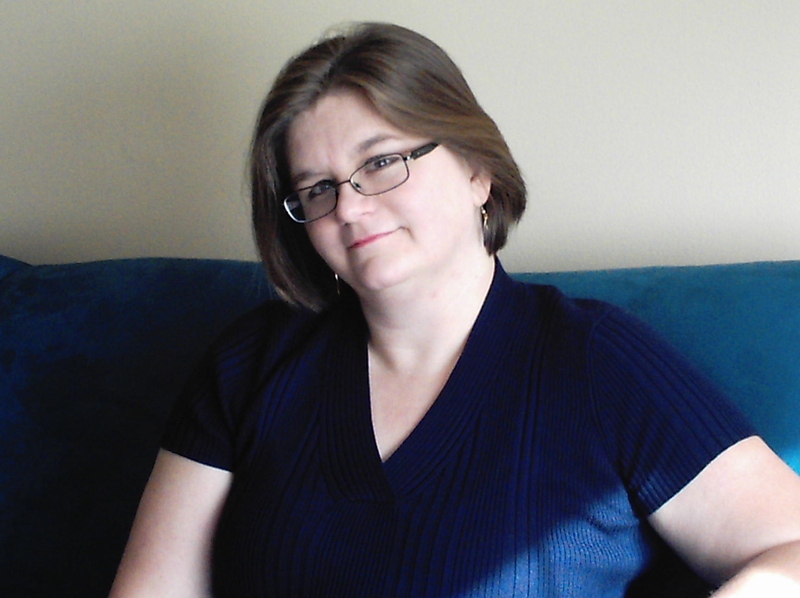 She has had 17 romances in historical, fantasy, gay, contemporary, and paranormal genres published by Amber Quill Press. Her first book with Medallion Press, “The Viking’s Witch” was released in August 2012 and won a 2013 Gold IPPY Award for Best Romance e-book. 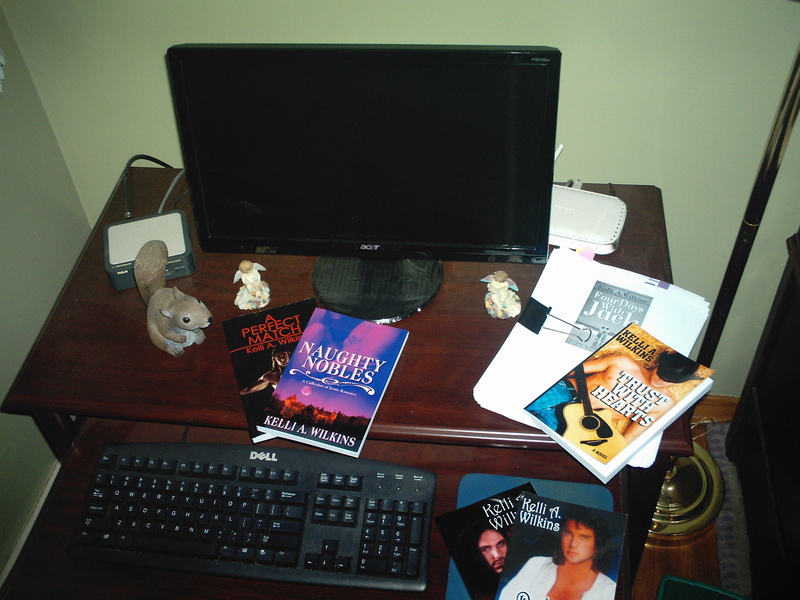 She has written 15 romances for Amber Quill Press. Her GWN blog tour will feature an in-depth interview, excerpts from both “Dangerous Indenture” and “Wilderness Bride”, as well as guest blogs. 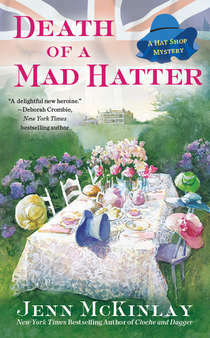 The second book in this New York Times bestselling series featuring an Alice in Wonderland themed afternoon tea! Scarlett Parker and her British cousin, Vivian Tremont, are hard at work at Mim’s Whims—their ladies’ hat shop on London’s chic Portobello Road—to create hats for an Alice in Wonderland themed afternoon tea, a fundraiser for a local children’s hospital. It seems like a wonderfully whimsical way to pass the hat, and Scarlett and Viv are delighted to outfit the Grisby family, the hosts who are hoping to raise enough money to name a new hospital wing after their patriarch.